The man who was bitten by a stray dog. KUCHING: An elderly man who was on his way to his morning prayers was badly mauled by a stray dog here, this early morning. The 75-year-old victim sustained serious injuries to his face. 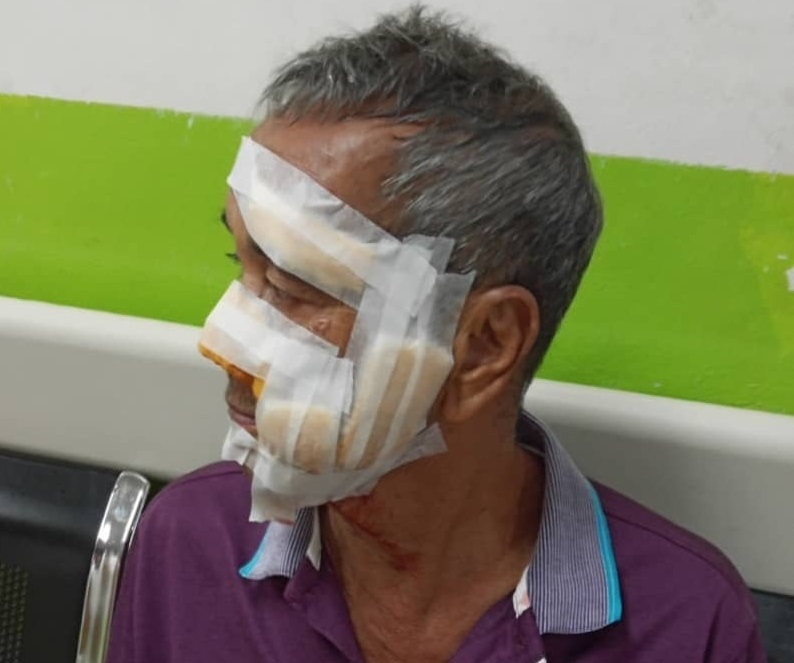 His eldest daughter told the New Sarawak Tribune that her father was on his way to pray at Surau Hidayatul Rahman Kpg Gersik, Petra Jaya at 5.30am when the incident happened. She said the dog pounced on him and attacked him. Villagers who came across the injured man sent him home. “My brother-in-law sent him straight to the hospital where he was given an anti-rabies jab. He will have to go for follow-up treatment. Kuching North City Hall (DBKU) was informed about the incident and it took immediate action by catching a few stray dogs in the vicinity of the surau,” she said. At press time, the old man is still in the hospital. “He will stay with me for a couple of days once he gets out of the hospital,” added the victim’s daughter. Asked if the dog in question was caught, she was not sure. DBKU Mayor Datuk Abang Wahap Abang Julai, when contacted, sympathised with the victim. He was attending a meeting on the Global Covenant of Mayors for Climate and Energy conference in Johor when the New Sarawak Tribune contacted him. “We have been doing our level best to catch stray dogs since the rabies outbreak. “Our two teams recently managed to catch as many as 60 dogs one particular day, which is well above our usual catch of four strays a day during normal times,” he added. Wahap advised the public to report to DBKU if they came across stray dogs in their area. He also urged the public to refrain from feeding the stray dogs and advised pet owners to keep their dogs in their compound and ensure that the animals are vaccinated. Stray dog bites man on his way to morning prayers 0 out of 5 based on 0 ratings. 0 user reviews. ‘The New Sarawak Tribune’ is an effort by a group of businessmen to retrieve the glory days of the now defunct ‘Sarawak Tribune’ (Sarawak’s oldest English daily set up in 1945), which was discontinued due to its publication of an Islamic caricature in 2006.